Rahul, who is in Bengaluru today for the first step in the re-launch of the National Herald, a Congress-run newspaper started by former prime minister Jawaharlal Nehru, said anybody, who tries to stand for the truth is pushed aside by the present government. "In India, power manufactures the truth and everyone knows what the truth is, but the people are scared to say it. Power of truth is being completely replaced by truth of power. The Government is forcing everyone into silence," he added. 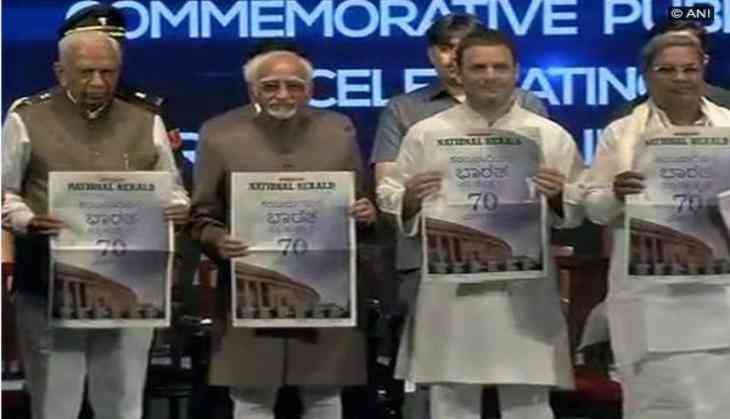 The Congress today launched a commemorative edition of the National Herald to mark the 70th year of Independence in the presence of Vice-President Hamid Ansari and Congress Rahul Gandhi at Ambedkar Bhavan on Millers Road here. This event wille followed by an official launch of the edition and formal print re-launch of the newspaper in New Delhi on June 20 by President Pranab Mukherjee. The paper will be published weekly from New Delhi. The online web edition 'Nationalherald.com' has been functional since last year and is being headed by Neelabh Misra as editor. The print edition of the newspaper was originally launched from Lucknow September 9, 1938, whose editor at that time was Pandit Jawaharlal Nehru, but it was later shut down in 2008 due to financial constraints. The newspaper has been headline after Bharatiya Janata Party (BJP) leader Subramanian Swamy filed a case against Congress President Sonia Gandhi , Rahul Gandhi, Congress Treasurer Motilal Vora, Congress leader Oscar Fernandes, Suman Dubey and Sam Pitroda. Swamy's application alleges that the Congress granted an interest-free loan of Rs. 90.25 crore to Associated Journals Limited (AJL), owner of the National Herald newspaper, adding that the Congress did bungling in the loan and it was not repaid in cash. Swamy further alleged that Sonia and Rahul were made directors of a company- Young Indian- in November 2010, which acquired almost all the shareholding of AJL and all its properties, reportedly worth Rs. 5,000 crore.